How are the payments for my professional website handled? 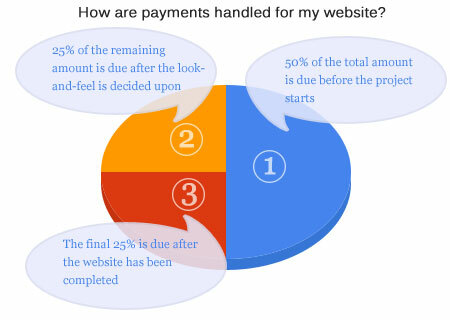 The first half of the total amount is due when the customer gives Midwest Web Design Inc the “green light” to get started with their website project. Then Midwest Web Design will begin creating the look and feel for your professional web design. The second payment is due after the customer agrees on the look and feel. This second payment is half of the remaining balance that is due (or 25% of the total original amount that the project was bid for). After the look and feel is agreed upon, Midwest Web Design will build your website with all the text and pictures, etc. When the pages are built and the website is finished, the final remaining balance is due (the remaining 25% of the total original amount that the project was bid for).